I have met my share of Olympians, primarily, figure skaters, since that was one of my daughter's passions before college and she even skated in a performance with Johnny Weir at Lake Placid and we met Sarah Hughes and Todd Eldredge at the Mullins Center at UMass and Paul Wylie at a skating performance at Harvard when I was a Radcliffe Fellow. Last weekend, I had a new experience - having dinner with an Olympic gold medalist, courtesy of my daughter, who has switched from figure skating to crew. Coincidentally, my Brown University room-mate for two years, Teresa Davila, had switched from being a ballerina in Chile to being a member of the Brown University women's crew team when she matriculated there. I guess it is all about the muscle and the discipline! The Olympian is Emory Clark, the author of Olympic Odyssey. The event was the Lafayette College crew banquet, which took place last Saturday. My daughter, as President of the Crew Club, got to officiate the lovely evening and we sat at the head table with the Olympian. The beautiful campus was resplendent with blooming flowers (something not yet happening much in Massachusetts). "Emory and I were fraternity brothers and classmates at Yale in 1960. Emory was Captain of Yale’s Varsity Crew that year. Following Yale, both Emory and I went on to serve as officers in the Marine Corps. Emory then began rowing for Vesper Boat Club in Philadelphia, where he went on to win the 1964 National Championship in the coxed pair. After that, rowing in the Vesper Eight, he went on to win the U.S. Olympic trials, beating heavily favored Harvard, Yale and a number of other top collage crews. That marked the first time a non-collegiate eight-oar, or club boat, ever represented the United States in the Olympics. In 1964, Emory and the Vesper Boat Club went on to the Tokyo Olympics, winning the Gold Medal and becoming Olympic Champions. Emory continued competitive rowing most of his life, winning many more races, right up to his early 70s. He book, Olympic Odyssey, has just been published." The evening was magical and below are a few photos from the great event. The Olympic gold medal is also featured below. I especially enjoyed hearing Mr. Emory Clark speak about his Olympic gold medal team-mates, who ranged in ages from 20 to 34, and the cox was a 46 year old Hungarian who had become a US citizen. He also spoke about Mr. John Kelly, the brother of the Princess of Monaco, Grace Kelly, who was affiliated with the Vesper Club. He emphasized how the team to beat at these Olympics (and many other races in that era) was the German team. And, yes, both my daughter and Mr. Hanke's son were recognized for their leadership on the crew team. My daughter is the cox for two men's boats and if you can get a group of men to row fast as a team together, you are a born leader! The medals and trophies that they have been garnering this crew season plus the fun that they have been having, even with pre 6AM rowing practices, say it all. When it comes to learning and education there is nothing like hearing from front-line expert practitioners. When the topics to be covered include emergency preparedness and disaster response some of the top experts who have played a role in responding to emergencies both local and global are right here in the Pioneer Valley in western Massachusetts. This is a public thank you acknowledging their contributions and willingness to share their wealth of experiences with students in a course on Humanitarian Logistics and Healthcare that I taught this semester at the Isenberg School of Management. The course, which has students from the Isenberg School, the College of Engineering, and the School of Public Health at UMass Amherst, covers all phases of disaster management from preparedness and mitigation to response and recovery. Those of us in western Massachusetts will never forget such recent “natural” disasters as the Springfield tornado on June 1, 2011, the once in a 500 year flood in Deerfield and surrounding areas due to Hurricane Irene in late August 2011, followed by the snowstorm in late October, 2011, which resulted in massive power outages, and Superstorm Sandy, which hit landfall in the U.S. on October 29, 2012, and is the second most costly natural disaster in the U.S. after Hurricane Katrina. And, of course, we will always remember the shocking Boston Marathon bombing of April 15, 2013, the suffering of the victims, and the heroism of responders. On February 4, 2015, Ms. Debbie Wilson, a registered nurse from Lenox, MA, who is also a student at UMass Amherst, spoke on her experiences, over a 6 week period last Fall in Liberia, working with Doctors without Borders in battling the biggest outbreak of Ebola in history. She talked about helping to set up an Ebola treatment facility for 120 patients, the importance of medical supplies and equipment, which would have to be delivered from Geneva, Switzerland. She spoke about her personal experiences donning the special protective gear with hygienists who would then spray the chlorine on her after which she could carefully disrobe. She dealt with temperatures of 100 degrees, horrible rains, insufficient food for the staff - essentially making do with bread and mayonnaise with some ketchup for many meals. She described how they got rid of the medical waste by burning it in a pit. She emphasized the importance of logisticians, known as “logs” and her travel there, in itself, was a logistical feat. Ms. Wilson traveled by plane, truck, and canoe. Through her efforts and those of her fellow healthcare workers, the survival rate of Ebola patients was increased. She asks now that we not forget western African countries since the healthcare infrastructure there has been decimated since so many doctors and nurses died battling Ebola. On February 11, 2015, Mr. Jeffrey Hescock, the Director for Emergency Management and Business Continuity at UMass Amherst since September 2013, spoke about protecting education, research, and the reputation of the university and how careful planning for sports events and other events on campus and periphery can enhance community building and minimize negative outcomes. In his previous position as the Emergency Management and Business Continuity Manager for the UMass President’s Office, Mr. Hescock was responsible for safely evacuating students and staff from UMass Dartmouth during the search for one of the Boston marathon bombers there. He described the shelters that were set up so that students, most of who are commuters, could reconnect with family members and friends. He also described the challenges of dealing with the immense media response to the events. Of course, given that we have had two university closings on Mondays this semester, due to major snowfalls, the students were also very interested in finding out who makes the decision to close the university. The emergency notification system, in particular, works very well. UMass has an excellent organization structure consisting of an emergency operations team as well as a business continuity and recovery committee and conducts not only table-top exercises but also field exercises such as the emergency sheltering exercise last spring at the Mullins Center, which also involved the town of Amherst. Ms. Kim Goulette, the new Executive Director of the Pioneer Valley Red Cross spoke on February 23, 2015. The Red Cross provides immediate response to people in need because of disasters. Whether it is food, blankets, drinks, or even teddy bears for children in the near term, or shelter, food, and resources during the recovery phase, Red Cross volunteers are there to help. Ms. Goulette spoke about the big fire in Amherst last summer in an apartment complex at which she assisted after only about 1 week on the job. She described the role of the Red Cross in feeding the National Guardsmen who were deployed to eastern MA because of the multiple immense snowfalls this winter that disrupted lives, transportation, and other infrastructure. The Red Cross, which consists of 97% volunteers, provided soup, peanut butter & jelly sandwiches, coffee and hot chocolate to the Guardsmen. A group of volunteers began their journey from the new Springfield headquarters with all the red cross activities now consolidated under one rook at 2AM to delivery nourishment. On February 25, 2015, Mr. Brian Rust, the Director of Security Services at Cooley Dickinson Hospital spoke. He had originally been scheduled to speak the week before, but had to deal with emergencies at the hospital, and they were not patient emergencies! Nothing like some real-life practice in disruption management. Cooley Dickinson Hospital, which was recently acquired by Mass General Hospital, is one of our community hospitals, serving about 200,000 people. It seeks to provide the best possible healthcare in an appropriate setting. He noted that the population always assumes that hospitals will be available, when needed. He emphasized how a hospital is supposed to be prepared to be self-sufficient post a disaster for 96 hours. This, of course, entails backup power generators, the stockpiling of essential supplies, which is challenging given a model of just-in-time daily deliveries of medicines, and possible needs for additional food. Hazard analyses are conducted each year to prepare for possible natural disasters, human hazards, and technological ones. He emphasized the importance of communications and building strong relationships with other hospitals, first responders, etc. During the snowstorms this past winter, 70 staff slept at the hospital to make sure that there was appropriate patient coverage, since a storm could affect transportation. And, the week prior to his lecture at the Isenberg School, Mr. Rust had to deal with multiple emergencies, beginning with a computer failure on Monday, followed by complete communication failure on Wednesday (not related to the Monday one) with no Internet or phone lines available. Hence, medical records could not be accessed electronically, and X-rays could not be read. Back to documentation on paper. This major disruption was fixed on Wednesday but then Wednesday afternoon a sprinkler pipe burst and flooded the back of the Emergency Room with thousands of gallons of water pouring in. There is a new cancer facility being constructed above the Emergency Room area and it seems that the pipe was not properly insulated. With facility experts on hand (luckily, he said, not everything has been outsourced) in a few hours the area was cleaned up and disinfected. During that period, however, 4 ambulances had to be diverted to other hospitals. On March 25, 2015, we had the pleasure of hearing Mr. Jeff Meyer, the CEO of Blood Services for the Red Cross in Massachusetts and Connecticut, who told us how he had been a consultant for the Red Cross and was offered a job with this organization the day before 9/11. After the terrorist attacks that horrific day, he decided that he wanted to help communities and accepted the job offer from the Red Cross. With an outstanding background in operations, including an MBA, he has helped the Red Cross in balancing supply and demand of this life-saving product that is also highly perishable and has dealt with many challenges in the changing economic landscape of blood supply chains. On April 8, 2015, the students got to hear from SMSgt Thomas Orifice of the 104th Fighter Wing of the Air National Guard in Westfield. He came dressed in fatigues and had the students at the edge of their seats as he spoke about the response to Superstorm Sandy. Because NOAA had forecasted Superstorm Sandy one week before landing, major planning could be done in a timely manner and, within 24 hours, the Air National Guard had mobilized and delivered water, food, and fuel, which was direly needed since, with the loss of electricity, the gas pumps were not functioning and public transportation in NYC was at a standstill. Mr. Orifice has had an over thirty year career with the National Guard and has served in France Italy, Germany, and Kyrgyztan, and also took part in the liberation of Bosnia and Iraq Operation Freedom. And, on April 22, 2015, last, but not least, the "other" Professor Nagurney (my husband), Dr. Ladimer S. Nagurney, who is a Professor of Electric and Computer Engineering and Biomedical Engineering, at the University of Hartford, spoke to the class on Disaster Communications, including the challenges of technology in this important domain, along with FirstNet. Many thanks to the above Hometown Heroes, who took time out of their very busy schedules to share experiences with students – we are very lucky to have you in our midst. Also, given that the number of disasters is growing, as well as the number of people affected by them, I have made the lectures, as well as many of the guest lecture presentations, available online. Now is that time of the academic year during which there are numerous deadlines but we still find the time to celebrate student and faculty accomplishments. Yesterday not only did we have an All School meeting to recognize doctoral student and faculty achievements but last evening was the UMass Honors banquet and, as Chancellor Kumble Subbaswamy said, this is always his favorite event of the year because we celebrate faculty accomplishments in research, teaching, and service. At this event we recognize recipients of Distinguished Teaching Awards, Conti Fellowships, and many other awards, including national and international ones that our faculty received. It was very special for me to see my Medal from the University of Catania in Italy, which I received last June, recognized in the glossy program! The dinner was delicious from the salad and beef tenderloin with veggies to the chocolate torte with cherries and whipped cream/ The company at our table was also wonderful! It was great to see Dean Mark Fuller there and also our Associate Dean Tom Moliterno. 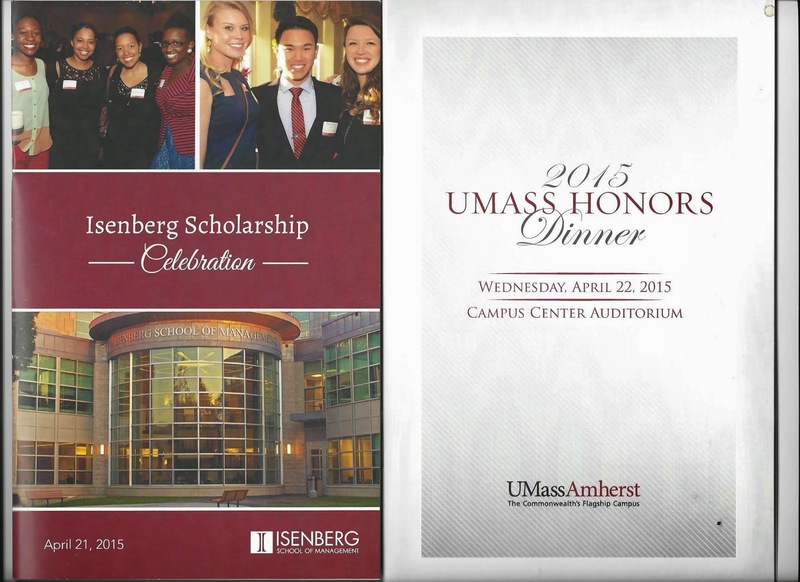 And,just the evening before, we had the Isenberg Scholar Celebration. 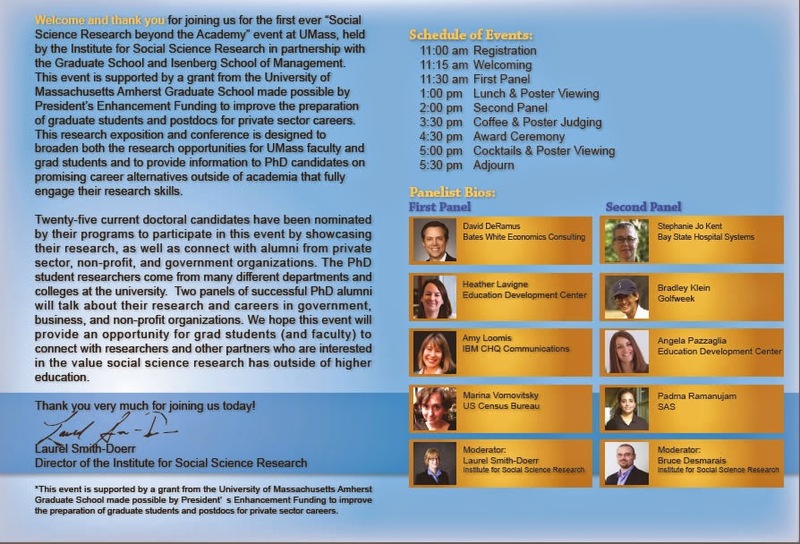 I took the photos below at the All School Faculty meeting at which my doctoral student, Sara Saberi, was one of 2 doctoral students recognized with the 2014-2015 Outstanding Doctoral Student Researcher Award. My colleagues, Professors Ryan Wright and Senay Solak each received Research Awards, as did Professor David Piercey of Accounting, and Professor Mila Sherman of Finance received a Teaching Award as did Pam Trafford and Professor Traci Hess from my department. Congrats to all the outstanding faculty and our doctoral students! This evening, we had the pleasure of attending the Isenberg Scholarship Celebration at the Marriott Center at UMass Amherst. There was some competition this evening since Jack '56 and Suzy Welch were also on campus promoting their new book. I was not going to miss the scholarship celebration since it was the second time that The Nagurney Scholarship was being given to a very deserving student and there were many other students recognized with scholarships and other awards. This year's recipient of The Nagurney Scholarship, which my husband and I endowed, is a double major in Computer Science plus Operations and Information Management! I also got to see some faculty and several of our PhD students, including my doctoral student, Sara Saberi, who was again recognized with the Isenberg Scholar Award (which she received twice) and today we heard other great news that Sara is also a recipient of the 2014-2015 Outstanding Doctoral Researcher Award. Now is certainly the time of the year in academia in which we recognize great students and what a pleasure this is! It was terrific to see several award-winning Operations and Information Management majors at this event. The food was delicious and the conversations lively. Associate Dean Linda Shea did a great job as an announcer and moderator with each student being recognized individually. Two highlights were the speeches by Vinnie Daboul '87, who was the alumni speaker, and whose daughter is graduating this year from the Isenberg School, and by Marty Boyle '15, who spoke on his great 4 years at Isenberg. Finally, it was wonderful to see Andrew Clendinneng, a fellow Canadian, who is our Executive Director of Development, and who closed the lovely evening with his remarks. Congratulations to all the remarkable students and thanks to the donors for their support. Mr. Daboul had several quotes from Kahlil Gibran on the importance of giving back - well said! This is a fabulous week with tonight the Isenberg School Scholarship Celebration taking place at the Marriott Center at UMass Amherst; tomorrow the UMass Amherst Honors dinner at the Campus Center as well as the Isenberg School Senior Barbecue plus All School meeting immediately prior, and Friday is a special conference organized by the Institute for Social Science Research (ISSR) at UMass. And, yes, we are still conducting classes! 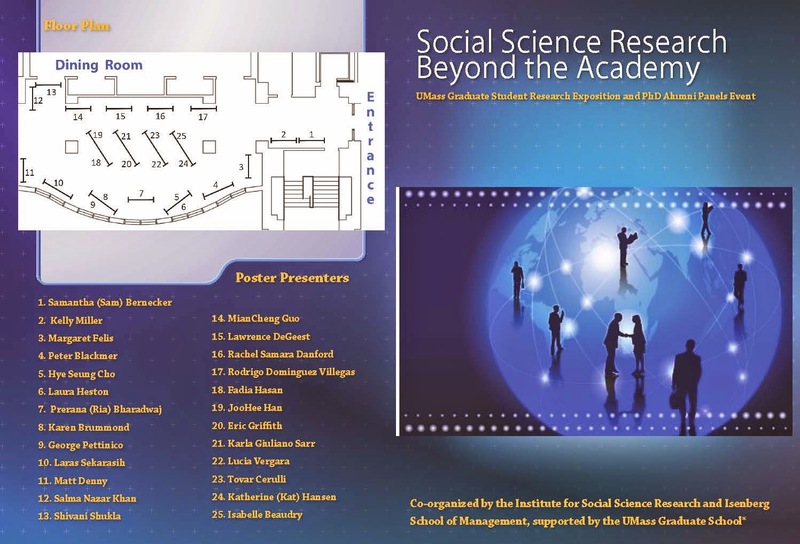 Friday's conference is on Social Science Research Beyond the Academy with PhD alum panelists and a graduate student research exposition. My former doctoral student in Management Science at the Isenberg School, Dr. Padma Ramaujam, who is with SAS in Cary, North Carolina, and with whom I co-authored the Emvironment Networks book, will be a panelist. Padma's dissertation received an INFORMS Transportation Science Section (now the Transportation Science & Logistics Society) best dissertation award, a highly prestigious honor. Also, my doctoral student, Shivani Shukla, will be presenting a poster at this conference on our latest research on cybersecurity investments. Dr. Laurel Smith-Doerr, the Director of ISSR, provided me with the nice flyer, reposted below, which mentions Padma and Shivani, both of whom are Supernetwork Center Associates. It should be a great event and week filled with so many celebratory activities recognizing the achievements of students and faculty! High impact experiences are essential to a college education and, on April 10, 2015, we had the pleasure of visiting ISO - New England to learn about how this organization manages the reliability of electric power for all of New England along with the pricing of it and planning for the future. I had been to ISO - NE several years back and had wanted to bring another group of students to this awesome facility in Holyoke, Massachusetts but the last time we had scheduled a tour, Superstorm Sandy hit, and it was very difficult to reschedule. This time there were several faculty that joined our group, which is featured in the photo above, and which also consisted of several students from our great UMass Amherst INFORMS Student Chapter as well as several students from my Humanitarian Logistics and Healthcare class. I have been fascinated by electric power supply chains since one of my research "bibles" is the classical book, "Studies in the Economics of Transportation," written by Beckmann, McGuire, and Winsten and in the book it is stated in the chapter on "Unsolved Problems" at the bottom of page 108 that: "The unsolved problems concern the application of this model (they were speaking of what we now call the elastic demand user-optimized transportation network model or the traffic network equilibrium model) to particular cases. A one-commodity network would be of special interest. In particular, the problem of generation and distribution of electric energy in a network comes to mind. The task of verifying the assumptions or modifying the model might be rewarding, but will call for considerable technical knowledge of electric engineering." With co-authors, I wrote a series of papers on electric power supply chains, in which we also transformed the electric power supply chains into transportation network equilibrium problems on an abstract network or supernetwork, resolving this unsolved problem of over half a century. Dynamic Electric Power Supply Chains and Transportation Networks: An Evolutionary Variational Inequality Formulation, Anna Nagurney, Zugang Liu, Monica-Gabriela Cojocaru, and Patrizia Daniele, Transportation Research E 43: (2007) pp 624-646. ISO New England provided us with an outstanding set of presentations on the state-of-the-art of electric power generation and distribution with new challenges of decentralization and balancing supply and demand with renewables such as solar and wind energy. We even got to hear how the R&D group is working on robust optimization in the context of electric power planning. We then had the shades, which had been drawn in the conference room, pulled back and we got to see the incredible control room with a huge screen depicting the New England power grid in real time! 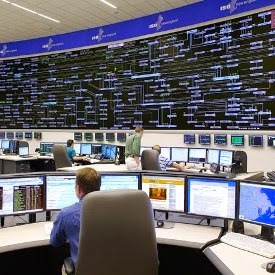 The below photo of the control room is courtesy of the ISO NE website. They also informed us of the ISO to Go! app, available for both I-phone and Android, which can be positively addicting. It provides info on wholesale prices (which can even be negative) as well as the fuel mix (wind, coal, natural gas, nuclear, etc.). Last winter, due to a capacity crisis in terms of natural gas distribution in NE, and the frigid temperatures, the fuel mix relied heavily on fossil-based fuels for electric power generation and we know from our high fuel bills that this winter was also tough financially. The wholesale price last winter was well over $50 per Megawatt hour and now it is about $14 but the price varies and is updated several times each hour. Thanks to ISO New England for such an outstanding educational experience for the students and faculty that you welcomed last Friday! I do believe that female voices need to be heard and not silenced and that is one of the reasons that I started this blog over 5 years ago. This week I had to recall Stella Dafermos, since her birthday was April 14, and, since she was born in 1940, had she lived, she would have been 75 years old this year! Stella was an Operations Research Paradigm Changer and I would say even a Research Paradigm Changer with her tremendous contributions to variational inequality theory, models, and algorithms, which allowed for the formulation, analysis, and rigorous solution of more general traffic network equilibrium problems that had, to that point been possible. The applications of variational inequalities now transcend operations research and transportation science and are fundamental to supply chains, game theory, regional science, economics and finance, as well as ecology. I am delighted that the book by Boyce and Williams, the cover of which is featured below, will be available soon. 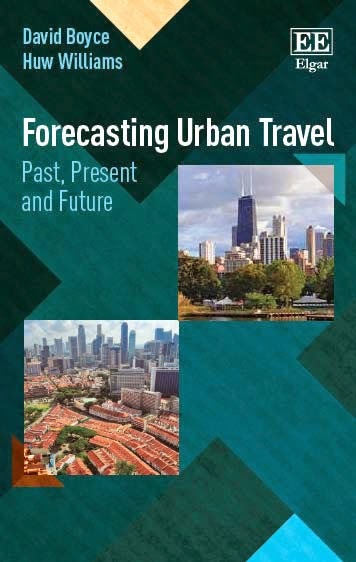 Chapter 7 in the book, which I had the pleasure to review and comment on because Professor David Boyce forwarded me the draft to read over, emphasizes the contributions of Stella to Transportation Network Equilibrium and I was delighted to see several of our joint papers cited. Stella, to this date, remains the only female whose memory and contributions are honored by the premier journal Operations Research with an obituary, that I wrote. It's research that is a paradigm changer that is truly brilliant! Her legacy continues to impact both research and practice in complex network and decision-making. She set the highest standards, which I try to impart to my students now. Where Do You Get Your Research Ideas From? This class I very much enjoy teaching because of the topics that we cover, the diversity of the students (from the Isnberg School of Management, the College of Engineering, Public Health, and Regional Planning), the great guest speakers that we bring in. Plus, we even did a tour last Friday of ISO - New England which I will be blogging about, since electric power is essential to our modern society. Also, I get great questions from the students and we have really good discussions that are even pushing research frontiers. To answer the question above, in addition to the points that I made in class today, I promised to provide some additional resources. Since this is a great question and some answers may be relevant also to my readers from near and far, below I have posted two sources of information. How to Do Research: Advice from Stellar Scholars in the POM Field. POM stands for "Production and Operations Management," but many of the suggestions are relevant to related and other disciplines. His study had been posted in the Journal of Operations Management page a while back and many of the points are relevant and current. I enjoyed being interviewed by Professor Jiang and honored to be included in the list of stellar scholars. The h-indices have increased since this study. Also, almost two years ago I gave a presentation in Sweden, where I hold a Visiting Professorship at the University of Gothenburg in which I highlighted where some of my ideas for research come from and I summarized Dr. Jiang's findings. problems or old tools for new problems? And today in class I even shared that some of my research ideas have come from my undergraduate students. This morning I visited the Hackathon at UMass Amherst, which is taking place April 11-12, 2015 at the stunning Integrated Learning Center. The Hackathon is called HackUMass and is the largest hackathoon in the Pioneer Valley. My husband and I were invited by Tom Kopec, who is an entrepreneur and a mentor to the hackers this year. The host of this year's hackathon is the Berthiaume Center for Entrepreneurship at the Isenberg School of Management, which is under the managing directorship of my colleague in the Department of Management, Professor Bill Wooldridge. We enjoyed seeing the students. some of whom were bright-eyed whereas others were fast asleep (on the floor, on couches, or on their keyboards). We enjoyed talking to some of the teams, including a team of students from multiple universities (I had to take a photo since I am a Brown U. grad), who have known each other since they were students at Wayland High School. I loved the drone with parts built by a 3-D printer, which also was used to construct the statue of my colleague, who is serving as a judge later today, Professor David McLaughlin of the College of Engineering. It was great to talk to Professor Wooldridge, who told me that he had slept in his office on an air mattress since he had to be available if there was an issue overnight. That's the dedication of Isenberg faculty! I look forward to hearing the results of the judging later today and the awarding of prizes. Given that 300 hackers showed up, according to Wooldridge, and that there was even an entrant from USC, this was clearly a very successful event. I was thrilled also to get t-shirst from Professor Wooldridge! I heard from Tom Kopec (in the above photo with me and Wooldridge) that last year's hackathon, which was hosted by the Department of Electrical and Computer Engineering, had mostly hardware entries - this year, about 75% of the projects are are software projects. I was also delighted to see female students om the mix. Thanks to the sponsors - some of my favorite companies, where I have both former students and great colleagues from INFORMS working. Today was a jampacked, fabulous day (although we did wake up to a blanket of snow and ice and it is April 9)! Today was the Data Science Center launch at UMass Amherst with a terrific program, many friends in attendance, and great talks and panelists. The venue was the 6th floor of the new Life Sciences Lab building at UMasss Amherst and there were refreshments upon our arrival. The first one I saw was Professor Andrew McCallum of the Computer Science Department, who is the Director of the new Data Science Center (and we hosted Andre in our UMass Amherst INFORMS Speaker Series a while back). He was a terrific master of ceremonies and the visionary and leader behind this endeavor as our Provost, Dr. Katherine Newman emphasized in her remarks. I snapped the photo of them hugging below. I got to chat with our Vice Chancellor for Research and Engagement Dr. Mike Malone and Professor David Jensen of Computer Science, who also spoke in our series. It was great to see my colleagues from Civil and Environmental Engineering, Professors Eleni Chritofa and Eric Gonzales, fellow transportation researchers. Our Chancellor, Dr. Kumble Subbaswamy and Provost Dr. Katherine Newman had opening remarks as did Professor McCallum. The keynote was given by Distinguished University Professor Jim Kurose, who is now serving in the CISE Directorate at NSF. He remarked how warm and lovely it was in DC with the cherry blossoms in bloom and then he landed in Bradley Airport and drove to Amherst through a hailstorm. He, as always, had some good jokes including his first presentation as an NSF program officer during which he did not thank the most important person (but thanked others). I left the event for 2 hours since one of my doctoral students, Sara Saberi, was defending her doctoral dissertation proposal (she passed, so congratulations are in order) and the photo below is of her with the dissertation committee: Professor Adams Steven, Tilman Wolf, and Michael Zink. I then came back for the poster session with my doctoral student Shivani Shukla and got to see more colleagues from the College of Engineering and the Isenberg School as well as meeting a professor from Smith College and talking with more Comp Sci professors. Another highpoint was seeing Chris Hill of MIT who came up to me to reminisce about when we were at the U. of Illinois' Supercomputing Center one summer for several weeks - this was very special and I have fond memories of (massively) parallel computing, which I loved to do! Once a programmer, always a programmer! As Professor Kurose said in his remarks, Congratulations to the Data Science Center,, and on a great launch event. Yesterday, we had the honor and pleasure of hosting SMSgt Thomas Orifice, who is with the 104h Fighter Wing of the Air National Guard, in my Humanitarian Logistics and Healthcare class. At first there was some added excitement because his presentation was secure and would not load but we managed to get it working! I had read an interview with Mr. Orifice , which I liked very much, including the wonderful quotes: I know that all of us would tell you that there is a shared sense of purpose and mission in the military that you don’t regularly see in civilian life. It is one of the major reasons I chose to make this my career. I work with people that are focused on getting the job done, and don’t let obstacles stop them. It’s amazing to see what the human collective can accomplish when they put their minds to it. Mr. Orifice has had an over thirty year career with the National Guard and has served in France Italy, Germany, and Kyrgyztan, where he told us he saw "frozen fog," and he considers that assignment one of his most fulfilling ones. He also took part in the liberation of Bosnia and Iraq Operation Freedom. He kept us on the edge of our seats as yhe spoke about the capabilities of the military in disaster relief, the restrictions, the Stafford Act, and the fascinating case of Superstorm Sandy and his experiences in the response in NYC. He eloquently emphasized emergency operations centers and showed informative photos and videos, including several on the emergency preparedness and response to Superstorm Sandy, the second costliest natural disaster in U.S. history. To be able to respond so quickly to Superstorm Sandy through effective military command and control, successful coordination with NYC city planners and the assistance of Mayor Bloomberg, and such impressive military logistics, for the timely delivery of food, water, and fuel, and the provision of shelter for the responders was awe-inspiring! NOAA had forecast the superstorm one week ahead of time which allowed for emergency declarations and meticulous preparation on the part of the National Guard. They were able to set up staging areas within 24 hours to deliver the necessary supplies and coordinated with NYC city planning authorities. They were not allowed to carry weapons and, hence, needed police assistance to assist in deliveries. The vehicles that the National Guard has from planes to high water vehicles to forklifts were very helpful in this major disaster relief mobilization. In addition, the National Guard brought their own shelters and set them up so as not to take up valuable hotel spaces in NYC. He emphasized specifically the devastation of the Rockaways. Also, Mayor Bloomberg allowed for taxis to obtain fuel since NYC residents are so dependent on access to transportation and the public transit system was shut down for days because of the flooding and electric power outages as well as fuel shortages. SMSgt Orifice did a great job reinforcing what the students have learned so far in this course and educated us with new information and material. He clearly showed the importance of logistics in humanitarian operations! And, he said that my students next academic year can get a tour of his National Guard facility - great to hear! A big thank you to SMSgt Thomas Orifice!